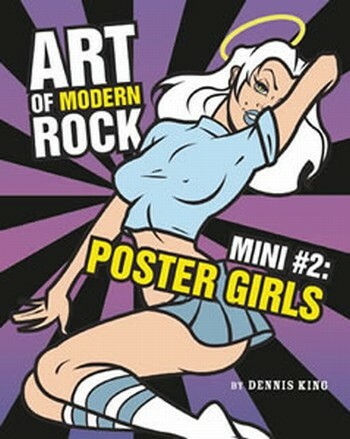 Art of Modern Rock Mini#2 Poster Girls ist als handliches Geschenkbuch konzipiert. Dennis King is the coauthor of Art of Modern Rock and an internationally recognized authority on rock posters and screenprints. Girls, girls, girls! There's no more popular subject for the modern rock poster than the ubiquitos poster girl. In this second pint-sized spin-off of the mammoth Art of Modern Rock, poster expert Dennis King rounds up the hottest chicks of the genre, be they rock-and-roll vixens, indie beauties, alien seductresses, or punk rock babes. With classic art from the original volume plus loads of new material - all focused on the strong and nice female icons of the poster world - rock fans, art and design aficionados, poster collectors, and new enthusiasts will be hardpressed to resist these dangerous curves. "ich will was gewinnen danke"